Nearly 7 out of 10 of sports fans who Like or follow brands on social media say theyre willing to take additional action during sports events, such as purchases, commenting on social posts or sharing brand content. 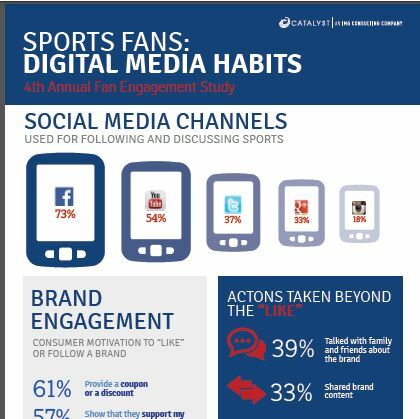 More than 50% of all polled sports fans engage on social channels while watching their favorites teams play. Its the first time in-game engagement surpassed the level of 50%. Almost 25% of all NBA and soccer fans say they are likely to view or comment on content of nonsports brands if its related to their favorite sports. However, fans will turn away if the contact is too frequent or irrelevant. Nearly 2X as many fans use Facebook compared to Twitter, at 73% to 37% respectively. However, they check Twitter about 1.5 times as often as they check Facebook on game day. The most engaging social content is based on pre-game excitement (72%), historic video (68%), bloopers (66%), Q&A with coaches and players (66%) and game debate/banter (63%). What is your social media strategy? Are you leveraging the information you have available to drive better engagement that results in sales with your fans? Download the full infographic above for some more insight.